As a child I remember my pop-up The Very Hungry Caterpillar by Eric Carle being the most frequently requested book by both myself and my brother at bedtimes and it’s the same with my kids although I wish we still had the pop-up version from my childhood. This month’s Virtual Book Club for Kids chosen author is Eric Carle and the co-hosts are featuring activities and craft to do with 3 of his books The Very Hungry Caterpillar, The Tiny Seed, The Mixed-Up Chameleon and we’ve chosen The Very Hungry Caterpillar and are going to work on a combination of sight words and fine motor skills learning to read the days of the week. Start of with printing out the Very Hungry Caterpillar Colouring Page and either colour in the images yourself or get your child to colour them in, also print out the Days of the week words. Cut out the fruit in groups and the hungry caterpillar as well as the individual days of the week and then use the laminator to laminate them all. You may be able to print on card and not need the laminating to make them easy to grip. 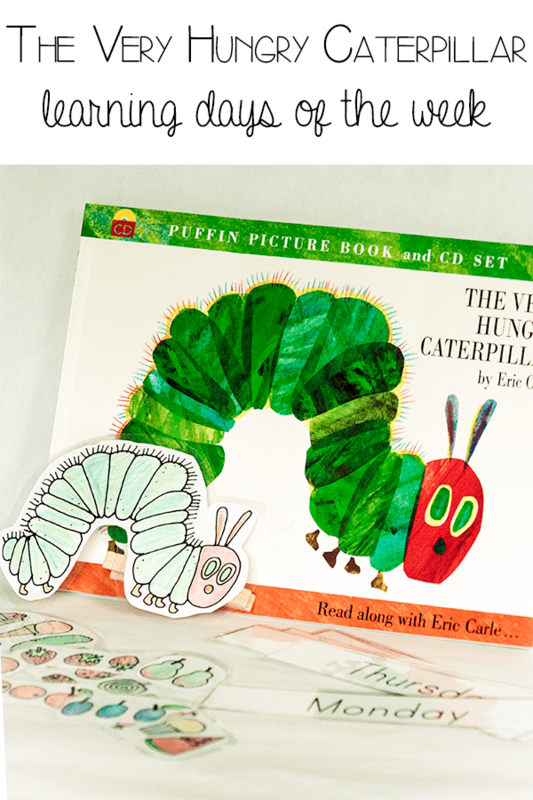 Once the words and food and caterpillar are laminated cut out around them and you’re ready to make your hungry caterpillar able to “eat” the food. On a clothes peg put a strip of the Double-Sided Super Sticky Tape – I love this brand as it really is sticky and it stays stuck, there’s no mess or waiting unlike with glue and you’re ready to play with the very hungry caterpillar straight away. Remove the top layer and then stick the hungry caterpillar on with the head at the end of the peg that opens and closes when pinched. Set out the food from the story in the middle of the table and the days of the week around the food – we left out Sunday. Then I showed T how to open and close the peg with the hungry caterpillar on. We then reviewed the story – On Monday the caterpillar…. so we started off finding the word Monday, she knows most of her letters and was able to identify Monday by the M and then we looked for the apple and she held it whilst making the caterpillar eat it and took it to the day of the week and let it go. We repeated with each set of food and finding the day of the week – with Tuesday and Thursday I gave her the second letter of the word and she identified the word and matched them up. It’s a work in progress but as it connects with one of our favourite books it’s something that we can return to time and time again. Inspired by this Eric Carle book based activity then check out more Eric Carle books that we recommend for Toddlers and Preschoolers. What a fun way to practice learning the days of the week! We love The Very Hungry Caterpillar!